Don’t miss out! 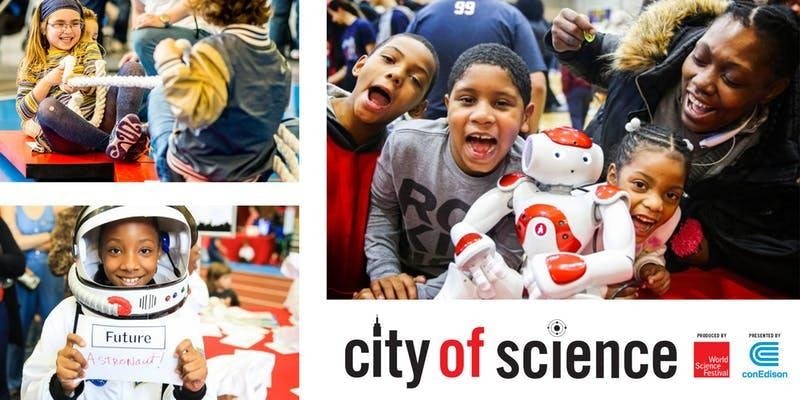 Join the World Science Festival and Con Edison for this larger-than-life, touring event where the wondrous properties of science, technology, engineering, and math collide. The day is jam-packed with interactive demonstrations, enormous exhibitions and hands-on activities. Kids can launch objects 20 feet in the air with a seismic accelerator, walk on water, topple seven-foot tall dominoes, create an orbiting universe at the Warped Space Gravity Simulator, explore mind-bending challenges and puzzles, bring Newton’s Third Law to life with a tug-of-war on wheels, and much more! A Camouflage Wall: Explore how animals use camouflage, while also experiencing the process by using camouflage suits to blend into a leaf-covered wall for memorable photos. The Reversible Mixing Station: “Un-mix” liquids in an amazing demonstration of thermodynamics. A high-impact Rotation Station: Enact dizzying feats of physics while spinning and twirling objects all while learning about angular momentum. Science Squad: From balancing birds (on noses or the tip of a pen) to untangling two people connected by rope, the roving Science Squad will inspire and entertain you while wait your turn to experience one of our exciting exhibits or demos.